The Mercer family has been working the land in southern Washington’s Horse Heaven Hills AVA for more than a hundred years. Rob and Will Mercer not only grow wine grapes, but also other fruits and vegetables - like baby carrots - near Prosser, Washington with the use of sustainable farming practices. Winemaker Jeremy Santo does a fantastic job with the fruit he's given. 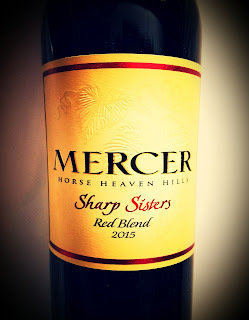 The Mercer 2015 Malbec (78%) and Cabernet Sauvignon (22%) grapes were grown in the Spice Cabinet Vineyard on a southeast slope above the Columbia River. The 2015 vintage was hot, and fruit came in about two weeks ahead of schedule. The grapes were not crushed, which they say preserved all the whole-berry characteristics. The juice experienced malolactic fermentation in French oak barrels, where the different lots aged for 18 months before being blended. Alcohol hits a lofty 14.8% abv and sells for around $20, which is a great deal. The Mercer Malbec looks dark ruby in the glass. The nose offers some beautiful dark fruit - plums, blackberries and currant - and sticks a lovely dose of French oak in there. A nice, savory hint of black olives lurks in the background. The palate is just as enjoyable, with a fruity focus augmented by peppery spice and cinnamon. This is a wine that will be a hit at the holiday table, no doubt. It's a festive, fun red that can hold its own with the standing rib roast. Escondido's Stone Brewing has long been a favorite in Southern California. They are probably a favorite in other areas, too, but I don't know what their distribution is like. You have to feel like you've made a good beer choice at the market when the guy behind you in the checkout line says, "Mmm, Stone. Good stuff." I understand that women sometimes talk to each other in the checkout line, even in restrooms, but men as a rule don't, so it's high praise when they do. Stone Ruination Double IPA 2.0 debuted in 2002 as a "liquid poem to the glory of the hop." They like to say they bow to both the beauty and the boldness of the little flower. They draw all the "piney, citrusy, tropical essence" of hops to make the craft beer lovers of today glad it's not the '70s anymore. For hops nerds, it's reportedly Centennial, Citra, Simcoe and Azacca hops that give Ruination its character. Ruination's nose gives a refreshing blast of citrus and floral, with a hint of that lovely bitterness you await on the palate. When you sip it, or gulp it, depending on how thirsty you are, you get that pleasure. Flavor is what IPA is all about, and Ruination delivers. The foamy head dissipates medium-quickly and leaves nice traces on the glass. Call it ruination if you like. I call it refreshment. 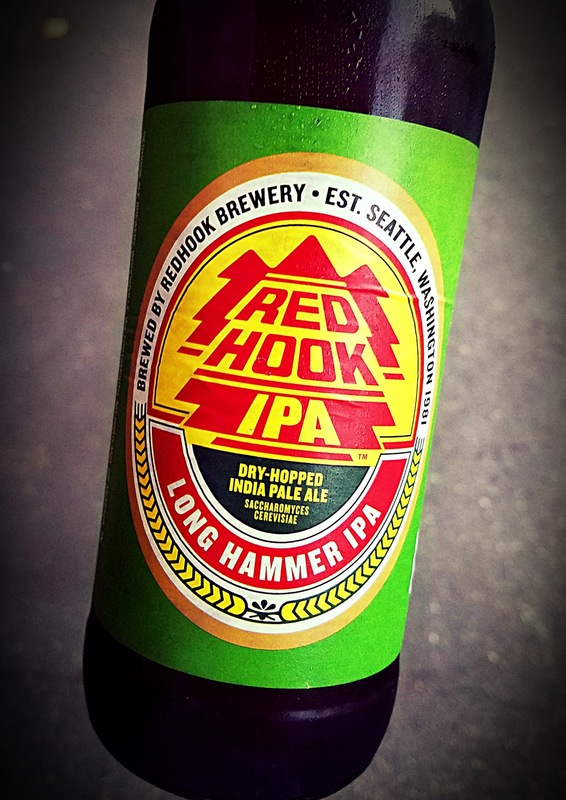 Redhook Brewing was founded in Seattle in 1981, when beer was bad and everybody knew it. The craft beer movement was the best thing to ever happen to beer drinkers. Once I broadened my beer horizon with Guinness, Newcastle, Fuller's ESB and the like, I could only smh - if that abbreviation had existed then - that American brewers couldn't seem to get beer right. Yet they sold damn much of it. Redhook was a favorite tap choice of mine in my San Diego years, of which there were only two. That handle seemed to be poking its head up from every bar in town, including the one across from my Pacific Beach apartment. I saw it a lot, and I called its name a lot. 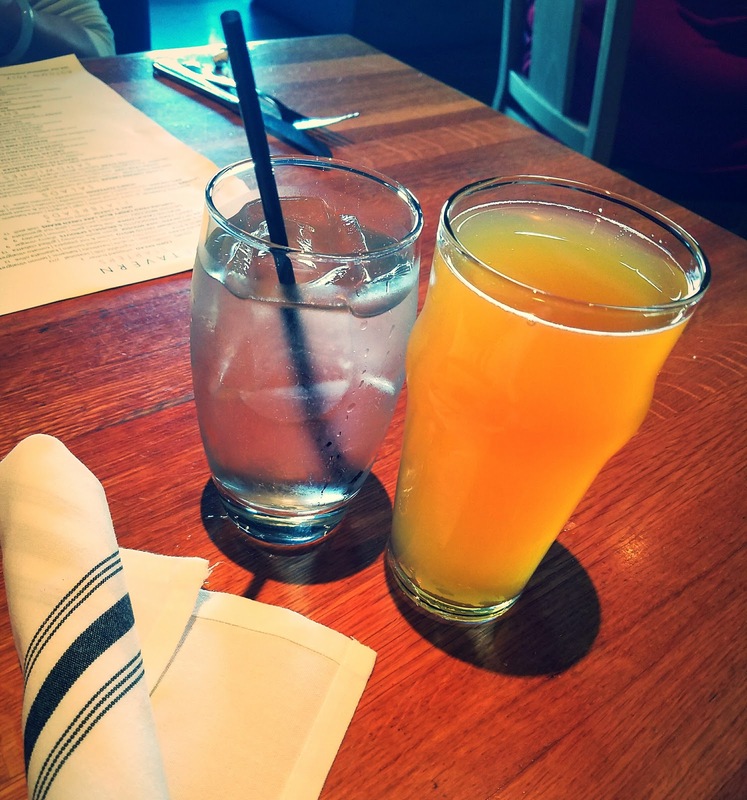 Before that, in L.A., my drinking buddies and I had the idea that you could order any beer with the word "red" in its name and feel secure that it would satisfy. Red Stripe, Mendocino's Red Tail, San Diego's Karl Strauss Red Trolley - there were probably more that I don't remember. The trick worked until Michelob, I believe, came out with a red-branded beer of some sort, then Bud. The novelty didn't work anymore. But Seattle's Redhook was always reliable. Plus, it has a cool logo. Oh, and they make a Purple and Gold version which I suppose is in honor of the University of Washington Huskies, although I'm sure the NCAA would not sanction such a thing. The NFL might, but the Seahawks' colors were too ugly for a beer can. Full disclosure: Redhook does actually incorporate an approximation of that green not found in nature on their Long Hammer cans and bottles. 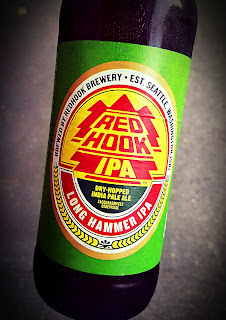 Redhook Long Hammer Dry Hopped IPA is an amber beer has a little oomph and a little less citrus than a typical India Pale Ale. The nose has a nutty, grainy texture - not really too floral at all. That's unusual in an IPA, which is usually hopped to the max. The Cascade hops used to make Long Hammer are administered with care and reason. It drinks smooth and easy, even when the chill has worn off a bit. A nice frothy head whips up on the pour and gets out of the way quickly. An earthy finish provides a nice memory. Alcohol at 6.2% abv means a couple of pints won't do you in. It hits me as a winter IPA, while the style typically makes me think of relief on a hot, sweaty summer day. This will do then, too. Mulholland Gin is called "The Spirit of L.A." on the label, and those who know about the history of Los Angeles are not surprised. William Mulholland built the aqueducts that allowed Southern California to siphon off Northern California's water. There'd be no San Fernando Valley without him. The label also says "In good times and bad, all will drink. If not water, then Mulholland." I'm for that, even though Mulholland Distilling is all the way over in Downey, not in the Valley. It's described as a new world gin made with botanicals of cucumber, lavender and lime. 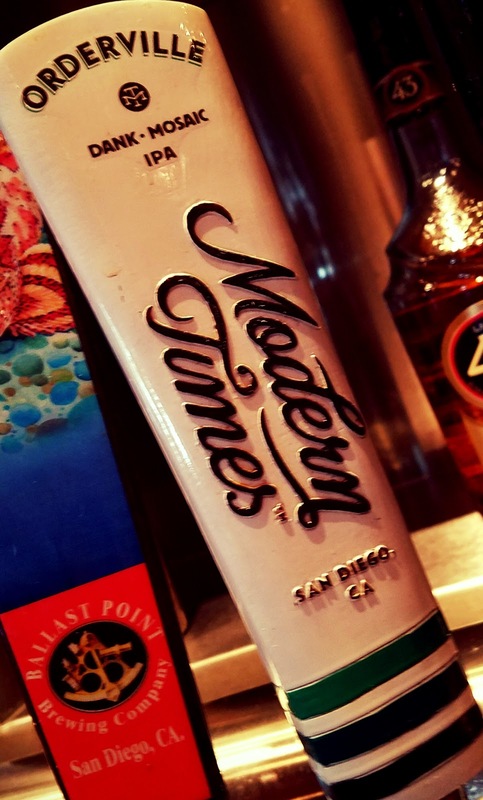 It's distilled from 100% GMO corn and hits Navy strength, at 48% abv, 96 proof. Walton Goggins and Matthew Alper collaborated on this gin, as well as a vodka and a whiskey. Goggins is a familiar face, having acted in some fairly notable television series. Alper has spent time on the other end of the lens as a cameraman and photographer. His brother founded OTTIMINO Winery while his wife is in sales at Frog's Leap Winery. The cucumbers in Mulholland Gin come across strongly, with lavender, juniper and vanilla notes right behind. It's a very aromatic gin, and has a flavor that’s refreshing on its own, although the alcohol level reaches up to about my limit. Still, it’s a great martini gin. I liked it better nice and clean instead of my usual dirty style. It may not be as thirst-quenching as water, but it's a damn sight more interesting. Israeli winery Carmel was established in 1882, so it's been around longer than the state of Israel. Shomron, where the wine is made, is in the West Bank region of Galilee. Grapes include 45% Shiraz, 30% Carignan, 20% Petite Sirah and 5% Viognier. Carmel is kosher, with alcohol that hits in the usual range at 14.5% abv. The label promises a light, fruity and refreshing wine. They say you should serve the wine chilled. The Carmel Mediterranean Red Blend 2016 is Syrah-heavy, inky, and earthy on the nose. Savory tones overshadow the plum, cherry and currant aromas, with a high, herbal note apparent - sage, perhaps. There’s a light cinnamon-and-vanilla feel as well. The palate is dark and fruity, with a firm set of tannins. Pair this easily with a standing rib roast over the holidays, whichever holidays you observe. Parducci has been producing wine for 85 years. It all started with John Parducci, known in the day as "Mr. Mendocino." He pretty much put Mendocino County on the wine map. Those who keep his vision alive today raise a toast to him every day, I would imagine. The winery gave me the opportunity to sample a vertical tasting of their Petite Sirah line. 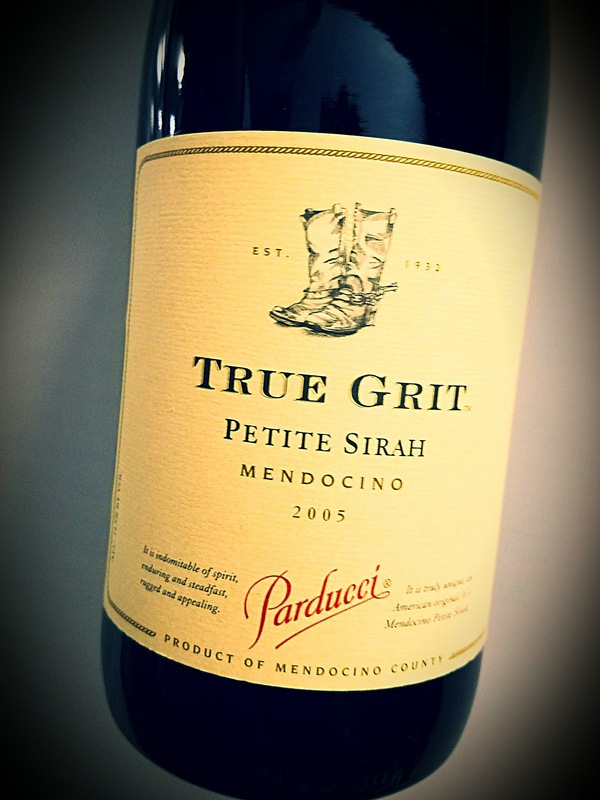 The True Grit mentioned on the label refers to the "determination, patience and vision" of the immigrant farmers who had the idea that grapes and Mendocino would pair well together. 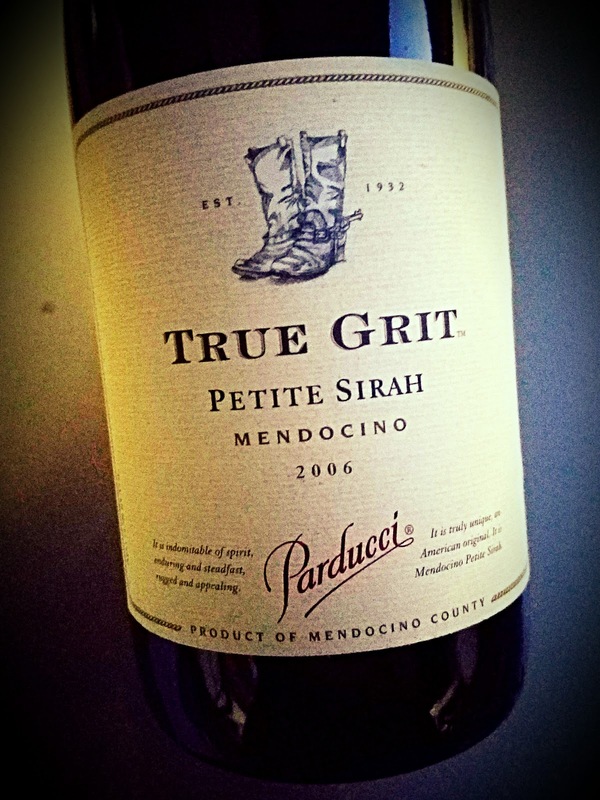 Petite Sirah, the label goes on, is "an American original, big and bold, with plenty of heart." This wine is indigo-black. No light is getting through the glass. A whiff shows some black fruit and some serious tar and forest floor. Smoke and leather play a role as well, with a hint of oak spice. As for the palate, don't tell me this is a 13-year-old wine. You can't kid a kidder. The wine is drinking extremely young, and showing its teeth in the tannins. These are jawbreaker tannins that could probably melt a steak by just pouring it on the meat. They do settle down a bit as the glass sits, but don't wait for this do become a "sipper." The darker savory aspects also strengthen as the bottle is open. Black currant and plums come through vividly, and the finish is long. This is an indigo-black wine, with nose that shows a lot more tar than does the 2004. Savory notes abound - tobacco, vanilla, black olive. The palate offers firm tannins, but nothing scary. Blackberry fruit comes off as if it’s been trampled underfoot and gets an overlay of spice rack. It finishes long and savory. This wine smells dark, but it's heavily laced with cedar and cigar box notes. Black fruit is apparent and rides high on the nose. On the palate, things are surprisingly nice and smooth. Firm tannins are no more than that, and the acidity is youthful. The taste centers on blackberries and a bit of savory tar, but much less than the '04 and '05 display. The martini. It's a classic cocktail. It's the classic cocktail. The martini is described as a drink made with gin and vermouth, and garnished with an olive or a lemon twist. It sounds so simple, and it's so good. It's perfect, already. No vodka martinis for me, please. I love the aromas and flavors of the herbs and botanicals found in gin, and vermouth for that matter. As for the recipe, I don't adhere to it. I stopped using measuring devices years ago and just eyeball the amounts based on how I feel at the moment. That may not work well in baking, but it does in mixing drinks. The 2:1 ratio of dry gin to dry vermouth is fairly easy to guesstimate. I like a 3:1 mix if I'm making the martini at home, a little heavier on the gin. If I'm out of vermouth, that's okay too. Lots of people go with a much higher ratio, so make it to your taste. The less vermouth, the drier the martini. There's an old joke about drinks so dry there was dust in the urinals, although I've never noticed any evidence of that. I like Hendrick's, a Scottish gin that is infused with rose and cucumber. As for the vermouth, it should be dry, too. The white kind. Vermouth is actually fortified wine blended with botanicals, like roots, bark, flowers, herbs, and spices. The name is an Anglicization of the German word for wormwood, which has been used in making vermouth. Without the gin, vermouth is a very nice aperitif all on its own. It was once thought to be good for what ailed one, and was used like Granny Clampett used her home-distilled concoction, for "medicinal purposes." I've had Cinzano, Martini and Rossi and Noilly Pratt, and all are fine. I 'm currently using Dolin de Chambery, and it's tasting very nice. I like to add a dash (or twelve) of bitters to mine. I ran out of Angostura bitters recently and bought a bottle made in New Orleans, Peychaud's bitters are based on the gentian flower, and are similar to Angostura bitters. Peychaud's has a lighter body, a sweeter taste, and more floral aromatics. It's used in making that New Orleans treat, the Sazerac cocktail. Shaken, not stirred, like James Bond? Experts say no. On TV's "The West Wing," President Bartlett said 007 was not only ordering a bad martini, he was being snooty about it. The shaking, while providing a good way for bartenders to show off, reportedly "bruises" the gin and makes the taste have more of a bite. Can't have that. Garnish with olives, of course, or a lemon twist if you're afraid of olives. Toss in a splash of olive juice to make it a dirty martini. If Vermentino grapes were as commonplace in American vineyards as Chardonnay, maybe the ABC attitude -- Anything But Chardonnay -- would be ABV instead. They're not, though. And they probably won't be anytime soon. That's why I cherish them whenever I can. Troon Vineyard's Craig Camp talks about two of their Vermentino wines, sounding like he's trying to choose his favorite child: "The 2016 Troon Red Label Vermentino, Applegate Valley is in the classic, richer, but still zesty style of Sardegna. The 2016 Troon Blue Label Vermentino, Cuvée Rolle, Applegate Valley was a co-ferment with 10% marsanne. It was named Cuvée Rolle (rolle is the name for vermentino in French) as the inspiration for this co-ferment comes from the richer rolle blends of the Languedoc in Southern France. As an interesting side note, there is actually more vermentino planted in France than in Italy." That should have them Rolle-ing in the aisles at the next tasting. The Red was fermented in steel tanks, while the Blue was done in oak barrels. Both were aged four months in neutral French oak. Camp calls the red label Vermentino a "decidedly different" expression of the grape, "grown on the granitic soils of the Kubli Bench in Oregon’s Applegate Valley." 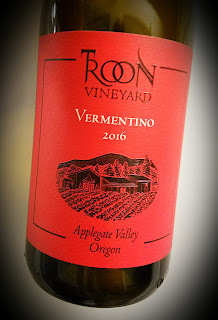 This wine is one of three different styles of Vermentino produced at Troon. 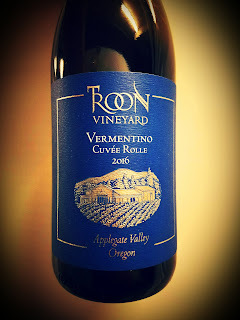 They call it their "sitting on the Italian Beach" Vermentino, made from grapes grown in Troon's sustainably farmed vineyards in southern Oregon's Applegate Valley. They picked the grapes a little earlier for this bottling than for the Blue Vermentino, which was left to ripen longer. Alcohol hits only 12.5% abv and it retails for $15. The Troon Vermentino is a light straw gold color and very clear in appearance. The nose is savory despite apple, lime, peach and tropical notes. There's a waxy, lanolin scent and some minerals, but the salinity is just what I always hope for in this grape. The mouthfeel is full, yet the acidity is racy. Sea salt tones color the apple-meets-lemon-lime fruit and an earthy element weaves its way through it all. That salty flavor stays around a good, long while, too. Don't over-chill your white wines. Troon's website pleads with you to refrain from refrigerating their Blue label Vermentino. They say a slight chill "emphasizes the wine's fruitier character," but a serving temperature in the mid-60 degree range "emphasizes the wine's savory qualities as well as its lightly tugging texture." They claim that, chilled, you're looking at notes of "yellow plum, papaya-with-a-squeeze-of-lime and guava." The slightly warmer expression "favors aromas of Spanish almonds and whispers of amontillado Sherry." In old-country fashion, they tread the grapes by foot for this old-country varietal wine. It hits 12.5% abv and retails for $22. The Troon Blue Label Vermentino looks so delicate in the glass. The pale color made me anticipate a light-hearted wine. It's a deception. The nose has notes similar to the Red Label, perhaps a little more savory - even yeasty. On the palate, the mouth is full and has great weight, while bringing a little more salinity to the show than the Red. Despite the almost creamy mouthfeel, the acidity is zippy and fresh. The third Vermentino in Troon's line up, the Black Label, spends a year in barrel on the lees. The 2016 is expected to be bottled in the spring.